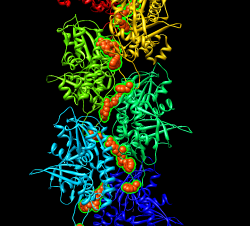 EMBO Practical Course: The combination of electron microscopy and x-ray crystallography for the structure determination of large biological complexes. Web site. 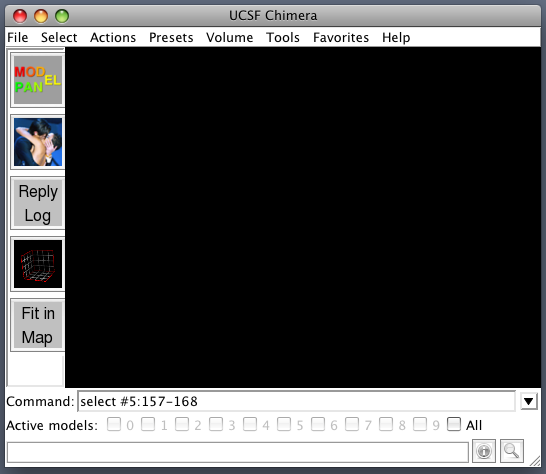 HIV and ParM tutorials require Chimera 1.4 (October 16, 2009 or later version). Data files. Quick reference for tutorials. These notes in PDF format. Introductions by participants: what biological systems do you study? what experimental technique (x-ray, EM, SAXS, ...) do you use, what university? How well do you know Chimera? Used on more than 20 different days? 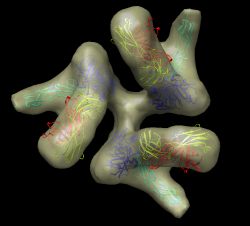 Basic Chimera data types: atomic models, maps, sequences, molecular dynamics trajectories. Basic Chimera tasks: simple analysis, make presentation images and movies. Different types of volume data (maps): EM single particle, EM tomography, x-ray, electrostatic potential, quantum orbitals. Chimera focuses on EM maps. 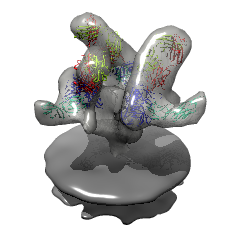 Chimera output: images, molecular models (alignments, simple structure editing), animations, measured quantities (contacting residues, distances, rotation angles, ...). 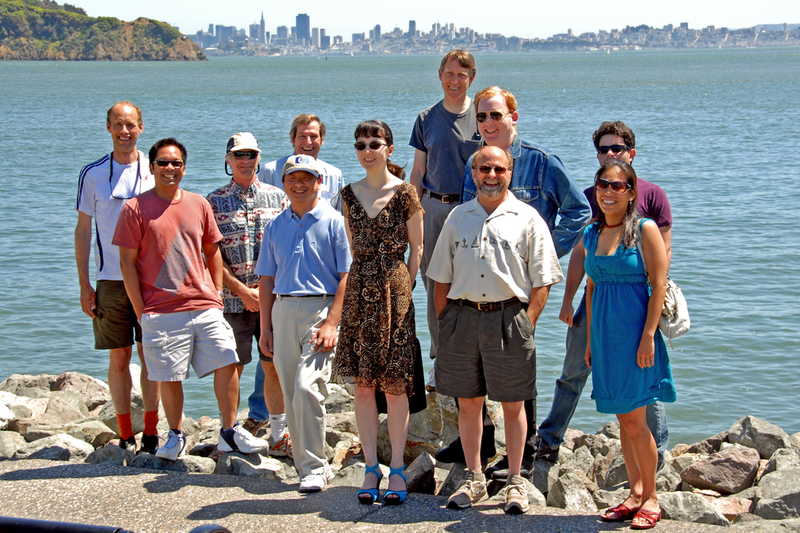 Chimera is developed by 4 programmers and one documentation specialist at the University of California, San Francisco. Conrad Huang - project leader, web services. Tom Ferrin - principal investigator. Eric Pettersen - structure and sequence analysis. Tom Goddard - EM maps and molecular assemblies. Situs - Global fitting algorithms. URO - Fitting with symmetry. 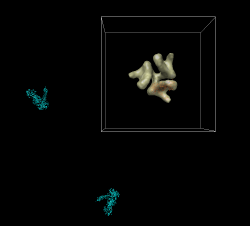 O - Molecular model building in x-ray maps. Chimera - Interactive fitting and analysis. Chimera provides no global fitting algorithms, does no long-running computations. It focuses on interactive data visualization and analysis, calculations taking fractions of a second up to a few seconds. 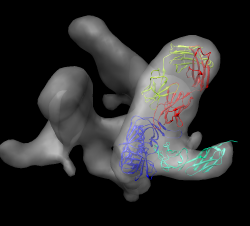 Training will cover fitting x-ray models in EM maps and analyzing and illustrating the fits (comparing conformations, domain rotations, contacting residues, movie making). Training will all be hands-on use of Chimera on two example systems. No theory. Morning session: HIV virus glycoprotein spikes. Afternoon session: ParM filaments. These are actin-like filaments that segregate low copy-number bacterial plasmid DNAs prior to cell division. 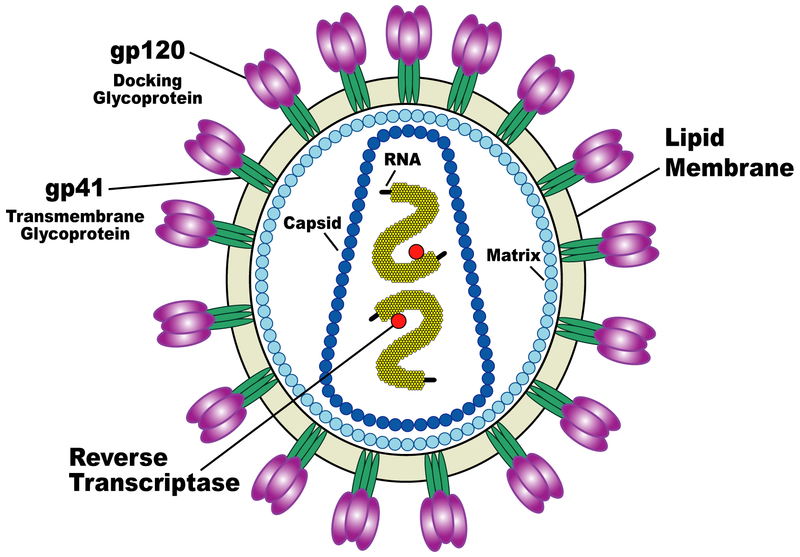 HIV spikes recognized CD4 receptor on human T-cells and target those cells for infection. 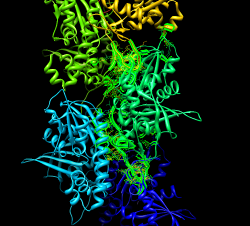 Transmembrane protein gp41 forms the base of the spike and assists fusion of viral membrane with cell membrane. 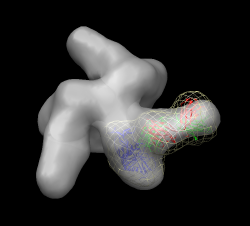 X-ray structures for monomer gp120 exist but not for trimer. 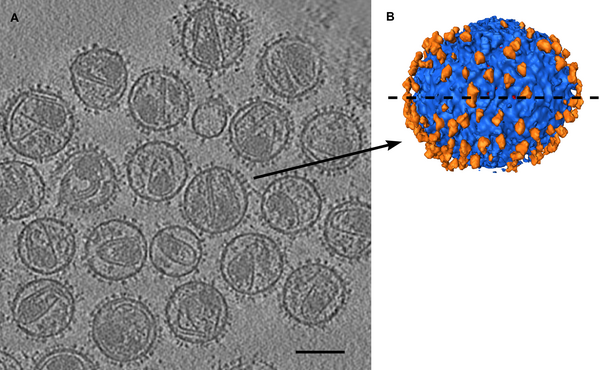 EM map of spikes from subtomogram averaging. HIV spikes. Stephen Fuller lab. HIV-1 BaL spike with CD4 and FAB 17b bound. Data sets. All maps 20 Anstrom resolution. 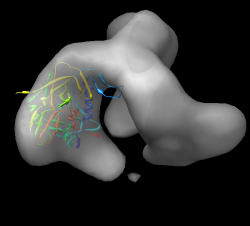 2ny7.pdb - b12 bound gp120 x-ray, b12 binds in different location than 17b. 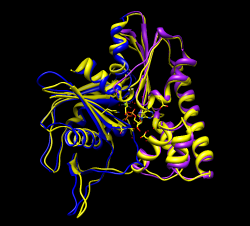 1gc1.pdb - CD4 and FAB 17b bound to gp120, crystal structure. Use menu entry File / Open, choose hiv/env_cd4_17b.map. This is CCP4 format map file, recognized by file suffix (*.map). Many other types read (e.g. Situs format, O format, MRC), show file types menu in open dialog. zoom - right button (also scroll-wheel). Demonstrate volume dialog basics. 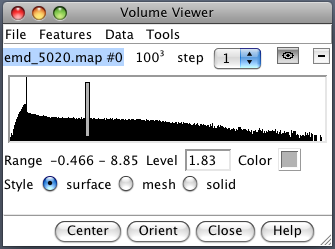 Map value histogram, contour level, map value range, contour level, color, style (solid used for tomography data), grid size, step size (show effect with mesh), show/hide, close map. Zoom out to see molecule is far away from map. Hide map with volume dialog. Center and zoom molecule with Actions / Focus. Color chains with command "rainbow chain"
show command-line Favorites / Command-line. 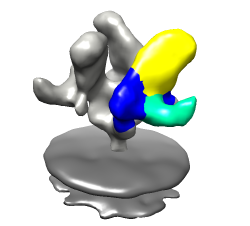 Mouse over chains showing chain ids in pop-up balloon. Model #, residue name/number also shown. Chain G (blue) is gp120. 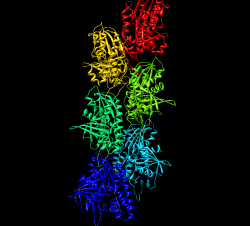 Chain C (cyan) is CD4 receptor fragment. 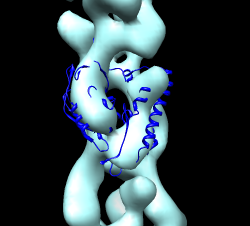 Chains L,H are bound fragment antibody (FAB) 17b. Display map with volume dialog show/hide icon. Uncheck active 0 button below command-line (freezes map). Drag molecule close to map. Check active 0 button, rotate to inspect superposition. Hide map, examine molecule shape, like letter L.
Look for L shape in map. 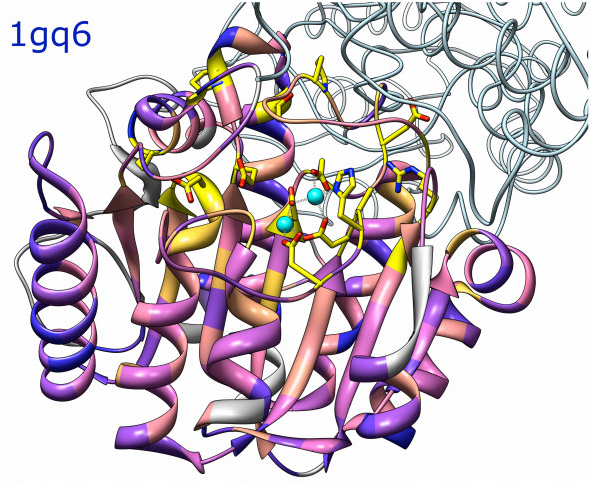 Use active 0 button repeatedly to hand align molecule in map. Hold ctrl key with middle mouse button to move in/out of screen. Make map transparent with volume dialog color button, click Opacity on color editor. Volume dialog menu Tools / Fit in Map. 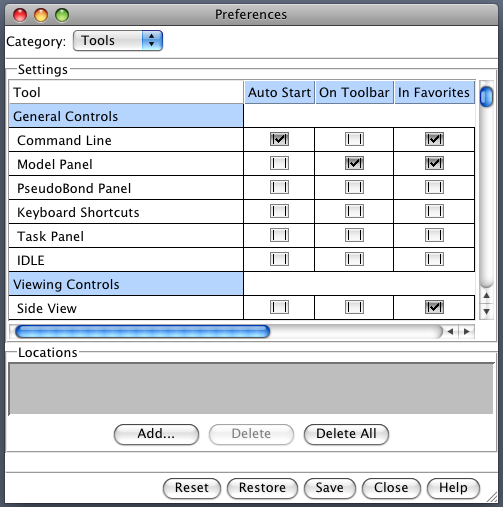 Fit dialog, choose 1gc1 from fit menu. Press Fit button on fit dialog. This moves 1gc1 to local best fit. Press Undo/Redo buttons to see how much it moved. Note average map value before optimization and after (using undo/redo). values meaningful since map value normalization is arbitrary. Note number of atoms outside displayed contour before / after. Display atoms: Actions / Atoms + Bonds / show. Zoom in, note many atoms outside are waters, mouse over to see name HOH. Delete waters. Select / Residue / HOH. Note 603 atoms selected. Actions / Atoms / Delete. Make surface opaque to see where atoms stick out. Press Fit more times. Note slight changes. 100 step limit. to enclose same volume as envelope of molecular model. Most commonly reported measure of fit quality is correlation. Show simulated map option, map resolution 20A. Fit. map). So it also is an ambiguous value unless fit accounts for entire volume. shown at contour level containing 95% of mass. Show correlation rises as lower contour (larger domain) is used. 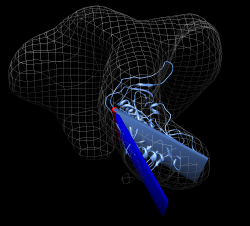 makes simulated map non-zero only close to molecule. Quit Chimera, restart, load session. Show how to save simulated map, and resave session, quit, restore session. Only Chimera will read session file. Other programs will read saved maps and PDBs. Close session, open map env_cd4_17b.map, pdb 1gc1_fit, and pdb 1gc1. Note colors lost. standard conventions for setting origin from map header values. on their own. 5 minutes. Walk around to answer questions. then flip 180 degrees, then use simulated map (corr 0.68). Close session. Open unbound map env.map. Use gp120 from 1gc1. Select chain G, invert selection, delete atoms. Now have participants do fit. Use high map threshold to see likely location. out. The triangle could go into the density in 6 ways. Differences in fit quality are pretty small. Look at 1gc1 fit into cd4/17b bound map to see what orientation it has. Idea is that bound versus unbound spike should not be too different. Start another Chimera and open cd4_17b_fit.py session. Hide CD4 and FAB. Select chain G, invert selection. Actions / Ribbon / hide. base. Loop is closer to spike axis. Use rainbow on unbound fit Chimera. Orient N,C termini down, loop near axis. Fit. This in fact gives highest average map value of 6 orientations. How much does the gp120 rotate when CD4 and FAB 17b bind? Restore CD4/17b session cd4_17b_fit.py merging with unbound session. Hide maps and non-chain G (select G, invert, ribbon hide). "measure rotation #1 #3 showslab true"
Color slabs to match ribbons and axis red using select and color menu. Note slabs depict rotation and shift along rotation axis. Hide ribbons with model panel (Favorites / Model Panel). Show unbound map mesh. shift along axis 9 Angstroms. Procedure used above won't work in exactly the same way. This is harder. moved and rotated the coordinate axes associated with each 1gc1 copy. coordinate axes for the two copies of 1gc1. For the spike with b12 bound we fit 2ny7 while the unbound fit is with 1gc1. hide maps, color unbound gp120 cornflower blue instead of rainbow. the original fit b12 molecule. Use Match Maker to align 2ny7 copy with 1gc1 (unbound gp120). different. Reply log gives 0.8 A RMSD for 142 atoms -- core is very close. blue for unbound, blue for bound. Reply log gives rotation 31 degrees, shift 3 Angstroms. 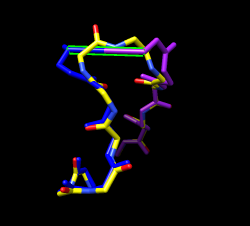 Want to make trimeric molecular model. Open CD4/b12 session cd4_17b_fit.py, close previous models. 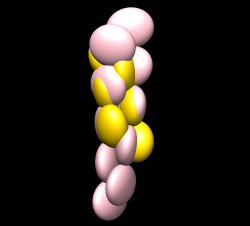 Command to copy molecule for 3-fold symmetry is "sym #1 group c3". Try it. 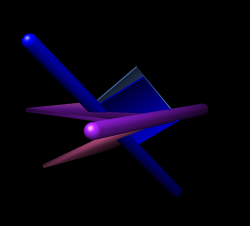 Symmetry axis not right -- using z axis through origin of molecule by default. being used is at corner of volume box. 50,50,50 would be (205,205,205) (205 = 50 * 4.1). Try "sym #1 group c3 coordinateSystem #0 center 205,205,205". to itself and look at the reported axis of rotation. Try "sym #1 group c3 coordinateSystem #0 center 207.9,204.9,0". Looks good. As a visual check rotate around axis in steps of 120 degrees. "turn z 120 center 207.9,204.9,0 coord #0"
"turn z 120 100 center 207.9,204.9,0 coord #0"
"turn z 120 100 center 206.9,204.9,0 coord #0"
"move 207.9,204.9,0 model #0 coord #0" after changing map origin. Set background color white: Actions / Color menu, background, white, all of above. Easier to use command "set bg_color gray". Silhouette edges. Tools / Viewing Controls / Effects, silhouettes. Include membrane map, open env_membrane.map. lighting. Tools / Viewing Controls / Lighting, quality glossy. Note also improves transparency, more opaque when edge-on view. from screen. Can be larger than screen for print images (300 dpi say). 1 minute if two monomers are hidden. 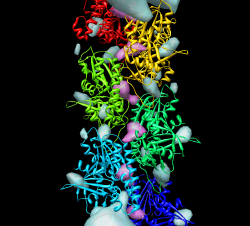 Less detail can be better for showing overall molecular arrangement. 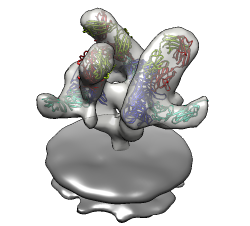 Could show ellipsoids for gp120, CD4, FAB 17b. Goal is to make an animation showing gp120 rotation when FAB b12 binds. First make simpler movies, then combine segments. Open unbound fit session unbound_fit.py. Rotate in 2 degree steps, for 180 steps, command "turn y 2 180". Make fit gp120 molecule fly into map. Zoom and move map and molecule to lower left corner. Deactivate map and drag molecule to upper right corner, rotate. Movie script to record this. 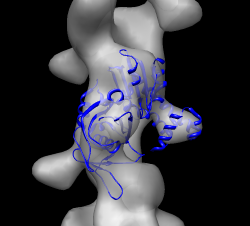 Open b12 fit without closing unbound map and molecule. Hide b12 map. Fade out unbound map by making it 100% transparent over 25 frames. can only correctly display one transparent map. increase transparency to 50% over 25 frames. ("final"). To get docked position use match-maker to align 2ny7 with 1gc1. Hide gp120 part of 2ny7 for fly in (~ribbon #3:.G). rotate gp120 and b12 to fit in bound map. 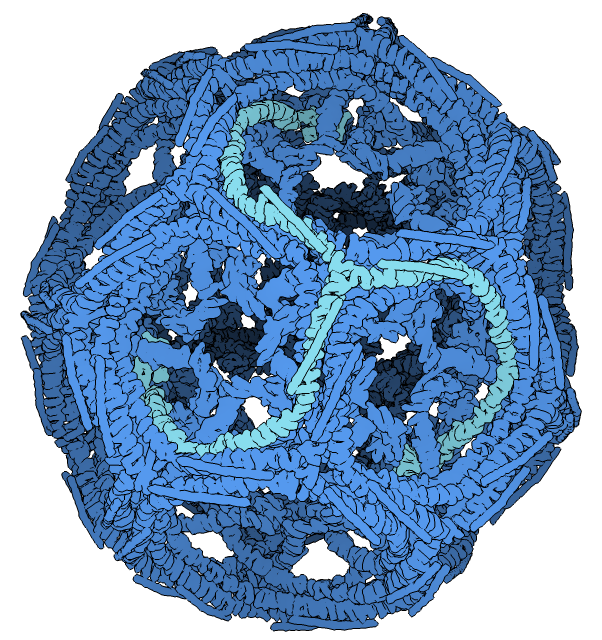 ParM is an actin homolog in bacteria that forms actin-like filaments. grows to microns in length pushing the plasmids away from each other. 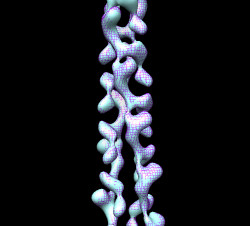 ATP is consumed to grow filament. Have participants find best fit on their own. Harder than HIV spike. Open parm_open.map and apo ParM (1mwk) and fit molecule into map. 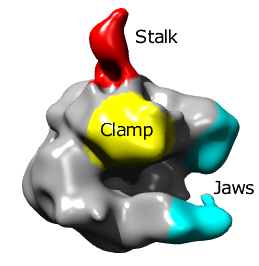 The 1mwk x-ray model has two copies of ParM, delete chain B. Note initial map step size is 2. Might change to step 1.
different correlations 0.58 vs 0.76. Open closed map parm_closed.map and try to align with open map. Rotating and optimizing fit produces poor results. not connected. Display one map at a time and compare. Note hooked lobe points down in open map and up in closed map. Flip closed map end-to-end and try fit. Use high thresholds. if measured over a larger region. A good way to see differences between maps is by morphing between them. outline box to see this. Remedy this by resampling closed map on the grid of open map in the aligned positions. "vop resample #2 ongrid #0"
write out the resampled map for this use. Use volume dialog Tools / Morph Map to morph between maps. Play. Show 1mwk fit to see change is primarily a domain motion. Record movie and play it. Save as AVI for Windows machine viewing. for 25 steps (0 to 1) instead of original 0.1 which gives 10 steps. Note that "morph" is nothing fancy, just linear interpolation at each grid point. 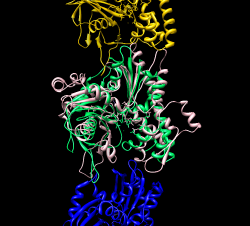 Look at the domain of the fit ParM molecule that is moving in the map morph. assess where hinge might be. Chimera does not do that. Color purple (Actions / Color) to distinguish that domain. Show closed map and try to move domain to fit. 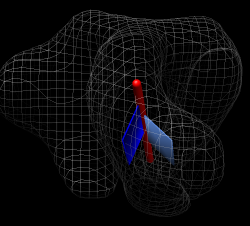 Optimize fit of selected atoms with fit-in-map dialog. Fit "selected atoms" in closed map. Try without simulated map. 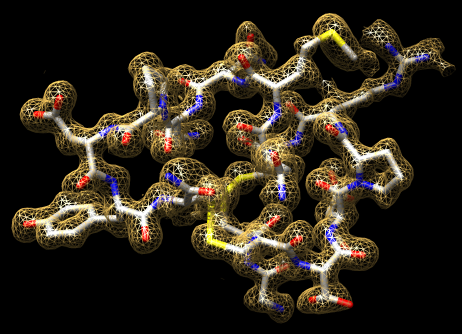 Note it moves whole molecule by default. Turn off "Move whole molecules"
correlation does not include far away regions. Then domain is further away. Hide maps and note bad contacts between domains. Measure motion of each domain. copy with "matrixcopy #1 #7"
"match move false showmatrix true #1:163-307 #7:163-307"
Match command normally moves the first molecule to align with the second. Use "move false" to prevent that. Output rotation with "showmatrix true"
Reply log indicates 30 degree rotation, ~3 Angstrom shift. "match move false showmatrix true #1:1-162 #7:1-162"
Gives 13 degree rotation, ~1 Angstrom shift. Get 21 degrees, 1 Angstrom shift. we can show those depictions. "measure rotation #7 #1 showslab t"
Use "ctrl-p" to show previous commands in command-line. Menu Tools / Structure Comparison / Morph Conformations. Add... #1, #7, #1 again to return to original state for movie looping. Create. Hide original two models and play movie. turning off "Iterate by pruning..." in MatchMaker dialog. Domain fitting has made bonds connecting domains extremely long. Mouse over long bonds shows bond lengths of 5-6 Angstroms. Add hydrogens and do other default minimization preparation steps. Minimizing whole molecule 100 steps takes about 3 minutes on my laptop. 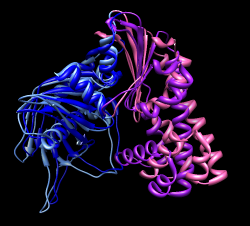 residues near domain connections (residue 162-163). forces are calculated using all atoms. have to save temp file and reopen. Change mcopy command to do this. Skip this part in tutorial? and start with command-line showing. Here's how. Click "Auto Start" checkbutton for Command Line entry. Press "Save" at bottom of dialog so settings are saved in preferences file. shift per monomer using self-fit. style mesh, use Fit dialog, look at results in Reply Log. Press Fit several times to see variation in values. Errors on repeated fitting tend to be about 0.1 degree and 0.1 Angstroms. proto-filaments are easily seen at high contour level. by changing sign of shift and angle. "findclash #4.2 intersubmodel true select true"
The "select true" option selects the atoms involved. shows the atoms and yellow lines connecting them. 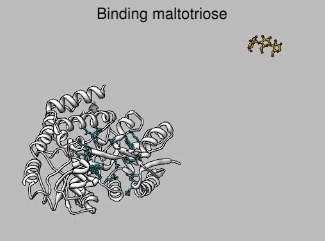 Mutations to residues 33, 34, 36, or 40 abolish filament formation. Are those near the interface between monomers? All are positioned between monomers. 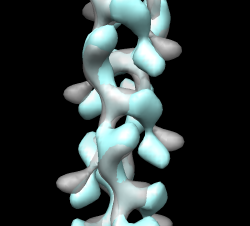 Actin filament is right-handed, ParM left-handed, why? Maybe hand of ParM maps is backwards? 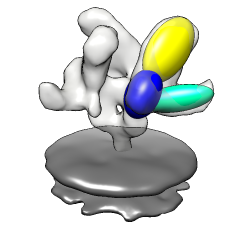 Try reversing hand by flipping z axis (vop zflip) and fitting ParM. Optimizing correlation of 1mwm in flipped map gave best result of 0.69. In original map correlation was 0.79. These are both quite good. 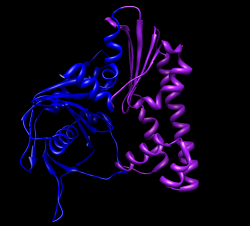 approximately colinear when one actin monomer is aligned with one ParM. sum of root-mean-square values use "minRMS" option. "vop subtract #2 #5 minRMS true"
Add negative contour level to difference map using ctrl-click on histogram. Turn of volume dialog Surface and Mesh option "Cap high values at box faces"
so negative threshold does not enclose entire box. is too large, cyan where too small. eliminating a severe clash with a neighboring monomer. Make a movie where both map and molecule morph simultaneously. Tools / Structure Comparison / Morph Conformations. Show how to get volume dialog back if you close it. Menu Tools / Volume Data / Volume Viewer. Make a reference sheet of how to find every tool used in training. Show download page and volume guide web pages. Describe relation between difference map residual RMS and correlation.